(Bloomberg Opinion) -- AT&T Inc. had a plan: Make the DirecTV business more profitable and accept that it would need to sacrifice some subscribers in the process. But so far, it’s still only doing the latter part – losing customers. More than 400,000 subscribers quit AT&T’s DirecTV satellite service in the fourth quarter, for an eye-popping total loss of 1.24 million for the year, the company reported Wednesday morning. 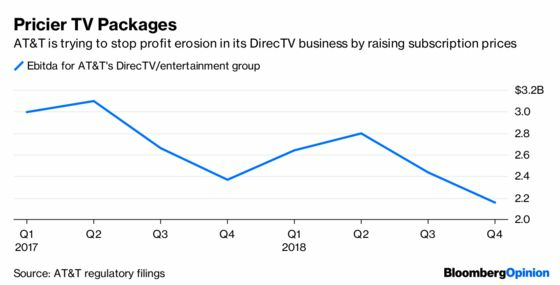 Perhaps more troubling though, its relatively new DirecTV Now streaming offering, which is supposed to be an area of growth, lost 267,00 subscribers as it eliminated promotional pricing. That’s 14 percent of its DirecTV Now subscriber base. AT&T’s share price slumped following the earnings announcement. DirecTV has been a sore spot for AT&T ever since it acquired the business in 2015, to the point that I’ve questioned recently whether it should just undo the deal (more on that lower down). AT&T CEO Randall Stephenson’s goal has been to finally stabilize profit in the unit this year, which will help reduce the overall company’s debt ratios and also put a floor under its sinking stock price. 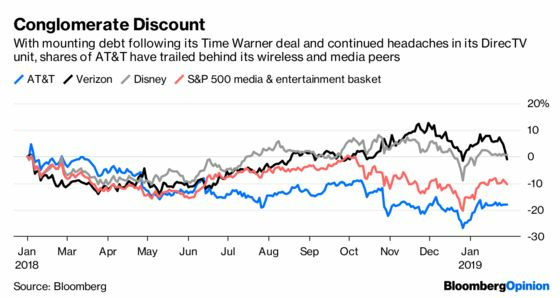 There’s pressure on Stephenson to meet a leverage target later in 2019, after swallowing Time Warner in a deal that was valued at $103 billion, including debt. And while its debt burden is mostly the result of that transaction last year, DirecTV is the one causing the headaches. The answer for DirecTV has been to raise prices, a move Stephenson recognized would result in customer defections, but would be worthwhile if it aided the bottom line. Except it hasn’t yet. The entertainment group, the name of the AT&T unit that houses DirecTV, DirecTV Now and the company’s small U-Verse brand, reported $826 million in operating income for the fourth quarter, a 17 percent decline from the same period a year earlier. The unit’s Ebitda was $2.16 billion, down 9 percent from a year earlier. On Wednesday’s earnings call, John Stephens, AT&T’s chief financial officer, said the entertainment group’s “Ebitda growth rate showed a sequential improvement even in a seasonally pressured fourth quarter” – which is another way of saying its Ebitda decline from the third to the fourth quarter was less intense than it was from the second to the third quarter. That’s not much to cheer about. But don’t say we didn’t warn you. In November, I wrote that this effort risks backfiring and that Stephenson and his team may be underestimating just how price-sensitive video-service customers are becoming in this age of Netflix and cheap streaming apps. And that’s before Walt Disney Co. adds to the competition with its own streaming offering later this year. AT&T had already hiked DirecTV Now’s subscription by $5 a month to $40 last July, in what was seen as a bold move shortly after a federal judge cleared its Time Warner acquisition against the wishes of regulators, who made the case that AT&T would use its newfound scale to charge customers more. DirecTV Now’s shrinkage is even more curious as AT&T embarks on a new subscription video-on-demand service through its WarnerMedia division, formerly Time Warner. The yet-to-be-named service will have three price tiers and showcase its newly acquired collection of films and TV programs, HBO’s content chief among them. While some streamers may prefer live TV channels like DirecTV Now offers, it isn’t difficult to imagine that a Netflix-like on-demand service from WarnerMedia may cannibalize DirecTV Now. As it is, attention and resources within AT&T seem to have already diverted to WarnerMedia and away from DirecTV, which any customer can tell you is in need of investment to improve its service. The unit also got very little billing in Wednesday’s earnings announcement. Should AT&T, the most indebted corporate borrower, struggle to meet its target net debt ratio of 2.5 times adjusted Ebitda this year (AT&T said Wednesday that the ratio is currently 2.9), selling DirecTV would be one way to shore up its balance sheet. There are caveats, which you can read about here. But the idea may not be inconceivable, given all the pressures on the company, including its own desire to continue its 35-year-run of dividend growth. AT&T’s wireless-phone business, its core competency, added merely 13,000 monthly subscribers and lost 410,000 users who had data plans for tablets and smartwatches. That adds to the evidence in Verizon Communications Inc.’s earnings report Tuesday of a maturing wireless industry, as investors await the launch of faster 5G networks to recharge growth. AT&T’s capital expenditures in the period were also lower than some analysts expected, perhaps a sign of AT&T trying to conserve cash. It could be that the payoff for the costlier DirecTV and DirecTV Now packages will be occur in subsequent quarters. But as of now, it’s looking like our 2019 horoscope for Stephenson is on track: He has a difficult year ahead of answering to shareholders who are running out of patience. Without a change, they may even start to wonder whether he’s the right person to manage this increasingly unwieldy conglomerate.